Last week the founding father of the Southeast Asian city-state of Singapore, Lee Kuan Yew, passed away at age 91. Lee served as prime minister for over 31 years and for a further 20 as an advisor to the government. Of his many legacies (high quality public housing for over 80% of the population, attracting foreign investment, etc.) his government’s focus on public transport was extremely transformative for this island nation. I thought that in honour of his passing, this ‘giant of history’ as President Obama said of him, I should write a bit about the remarkable transport and spatial planning of the Republic of Singapore. The central business district (CBD) of Singapore lies on the southern coast roughly at the centre of the island, at the mouth of the tiny Singapore River. It is a densely built urban area with skyscrapers and government buildings. Most Singaporeans do not live in the CBD, but rather in ‘New Towns’ elsewhere on the island. Yet unlike the typical automobile-caused sprawl we see in North America, Singapore was able to tightly control where development occurred by drawing on examples from far off Scandinavia. The spatial planning of Singapore took into account that public Housing and Development Board (HDB) flats needed new land to be built on to house the city’s rapidly growing population. Instead of cramming them all into the periphery of the CBD, which would have created a blob of sprawl rife with mobility problems, the HDB built new developments farther inland. How would people get from these New Towns to the CBD for work? Roads (for buses) and rail (for Singapore’s Mass Rapid Transit, or MRT) linked these New Towns to the CBD, and each other, in what is known as the Constellation Plan. Each New Town is connected to the CBD with very direct radial routes. The New Towns are connected to each other via orbital routes. 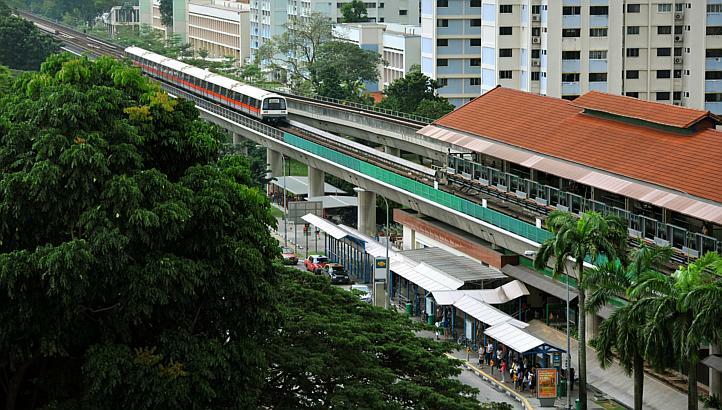 Each MRT station in a New Town has a synchronised feeder bus system to solve the ‘last mile’ mobility issue and bring people to and from the rail connection in their area (last mile solutions are critical for any transport system to function effectively, but need not be motorised*. Why is this necessary? Well, if you live in one New Town but work in another, and thus have no need to enter the CBD, why should you have to pass through it and thus add to its congestion of commuters? You could instead simply hop on the MRT or a bus travelling on an orbital route around the island to reach your destination. With this spatial planning system, the master planned New Towns function as small satellite cities, each with their own supply of housing, jobs, shopping and other essential services, yet they still maintain the vital link to the CBD. It’s been dubbed the Constellation Plan because, on a map, the CBD appears as the central figure, the sun, around which the New Towns orbit as satellites. 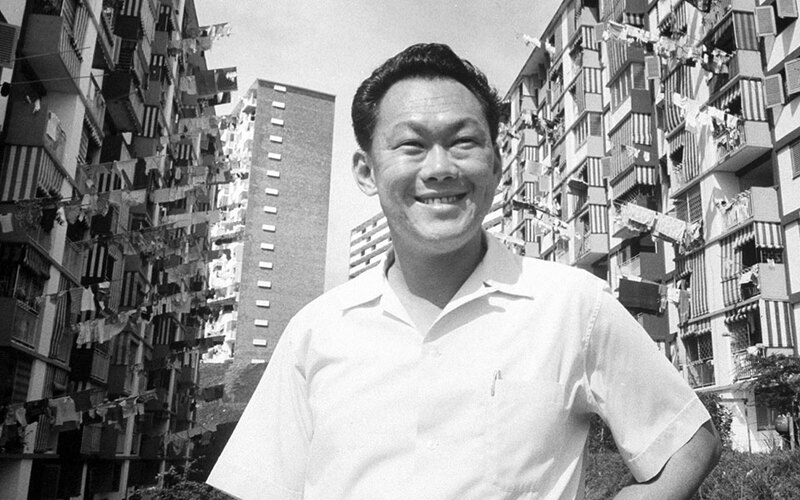 Lee Kuan Yew’s vision for a housed, employed, prosperous population involved a multitude of plans and policies across all spheres of life, but without his government’s clear and responsible vision for transport and spatial planning much of it would have been in vain. What was admirable and special about Lee was that his purely pragmatic, no nonsense way of doing business and governing meant that he was not afraid of looking elsewhere for ideas. If an idea sounded good, he tried it. If it didn’t work, he tried something else. If it was good, he kept it and expanded it across the board. The Scandinavian spatial planning model, best observed in Copenhagen with their ‘Finger Plan’ (see Suzuki et al., Transforming Cities With Transit, World Bank, 2013), was a proven method that reduced sprawl and encouraged transit oriented development with dense nodes situated along a transport corridor. It ended up working in Singapore incredibly well. What we need to see in the United States is a willingness to not only learn from cities and governments abroad, but actually implement some of those ideas, test them and spread them if they work. Being unafraid and unashamed to draw such ideas from elsewhere can result in great success for everyone. That model of learning and doing is, for me, one of Lee Kuan Yew’s greatest legacies.